The rate of incarceration in Vermont has dropped by a third over the last decade, according to a new survey by Pew Charitable Trusts. But officials with the Vermont ACLU says the state still jails far more people than it needs to. The Vermont chapter of the American Civil Liberties Union has launched a campaign that will try to cut the state's halve the prison population in Vermont. The rate of incarceration in Vermont has dropped by a third over the last decade, according to a new survey by Pew Charitable Trusts. But officials with the Vermont ACLU says the state still jails far more people than it needs to, and it’s assembled a roster of state and national figures to press for bail and sentencing reforms. That push began Wednesday with testimonials from people like Bill Cobb, deputy director of the ACLU’s national push to curb incarceration rates. Cobb says he knows a thing or two about the out-of-state prison where more than 200 Vermonters are currently serving their sentences. Back in the 1990s, Cobb spent two years at the Camp Hill Prison, located just outside Harrisburg, Pennsylvania. About 200 current Vermont inmates are currently housed at Camp Hill Prison in Pennsylvania. This fall, VPR reported that two Vermont inmates, Roger Brown and Tim Adams, passed away in prison at Camp Hill. “I can testify that those individuals are not getting better because of the time that they’re doing away from their families incarcerated out of their states,” Cobb says. 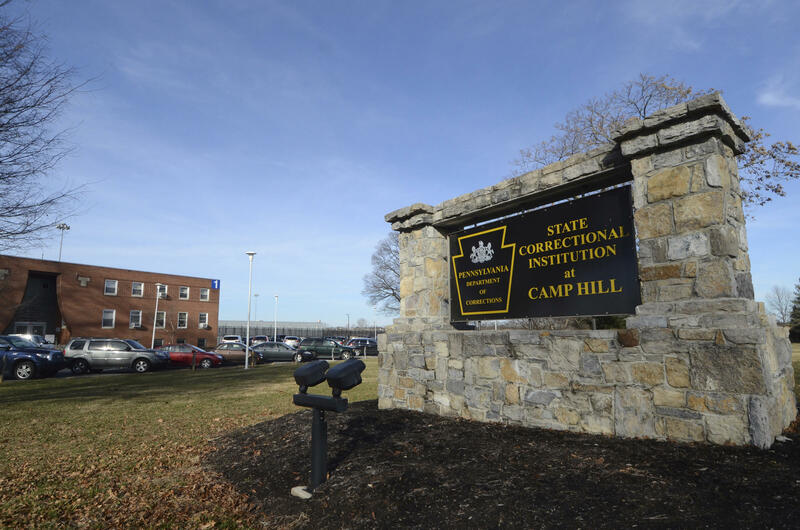 Camp Hill Prison in Pennsylvania where Bill Cobb was in the 1990s and where approximately 200 current Vermont inmates are currently housed. Cobb says racial disparities in the inmate population in — one out of every 14 black men in Vermont are in jail — are more pronounced than in any other state in the country. All told, Cobb spent six years in prison in the 1990s, for robbery, among other things. Today, he says, he’s a husband, a father, and a contributing member of society. Cobb says there’s nothing exceptional about him, and that there’s no reason to think the 1,700 people serving time in Vermont right now aren’t capable of the same kind of turnaround. “Let’s think about the possibilities if we responded to crime, drug usage, differently,” Cobb says. New research from Pew Charitable Trusts shows that Vermont has done a better job than any other state at bringing down the rate of incarceration over the past decade. But while incarceration rates may have come down off their peak, Vermont jails twice as many people today as it did in the late 1990s. “I graduated high school in the late '90s. It’s crazy to think that the prison population has doubled in half my lifetime and that that is consistent with our national trends,” says Nico Amador, a community organizer at the ACLU of Vermont. Amador says the ACLU will be working at a grassroots level to galvanize support for policies needed to reduce the prison population, and eliminate racial disparities in the criminal justice system. Amador says achieving that goal will require statutory reforms to bail and sentencing policies. He says the ACLU will be trying to build political support at the county level for a more progressive prosecutorial approach from locally elected state’s attorneys. Amador says the campaign is also about changing the state’s approach criminal justice more generally. “We as a society really have to decide and reach some consensus about what direction we want to move in,” Amador says. Ashley Sawyer, a member of Vermonters for Criminal Justice Reform, served time in a Vermont prison. Like Cobb, she says she too can testify to the ineffectiveness of incarceration as a rehabilitation strategy. Earlier this month, the Scott administration proposed spending $150 million over the next 10 years on the 900-bed prison facility. Sawyer says Vermont could use those resources more judiciously. The Vermont ACLU says that’s exactly the approach it will be pressing lawmakers and the governor to embrace. The Agency of Human Services has released a plan for a massive new “campus-style” facility in northwestern Vermont that could reshape the state’s mental health and corrections systems. We’re talking about the proposal and how it would work. The administration of Gov. Phil Scott is proposing the construction of a campus-like corrections facility in Franklin County that would include 925 beds. Police Data Show Racial Bias, But What About The Rest Of The Criminal Justice System? Data collected by the state police point to racial disparities in traffic stops – and apparently the number of incidents is rising — in spite of increased attention to the issue.